Receiving this email was music to our ears! Congratulations! 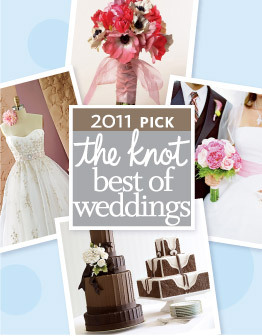 Thousands of brides reviewed their wedding vendors and you were voted a Best of Weddings Pick! Thank you all so much for choosing Sixpence For Your Shoe, as a knot, best of weddings winner for the second year in a row! We are thrilled and honored. We have an incredible lineup of clients, with beautiful venues and wonderful vendors, and we can not wait to see 2011 unfold. Stay tuned to our blog to follow along. wahooo! well deserved :) hope you ladies have a fun weekend planned!